Wrapping paper/Christmas gifts nail art | Light Your Nails! 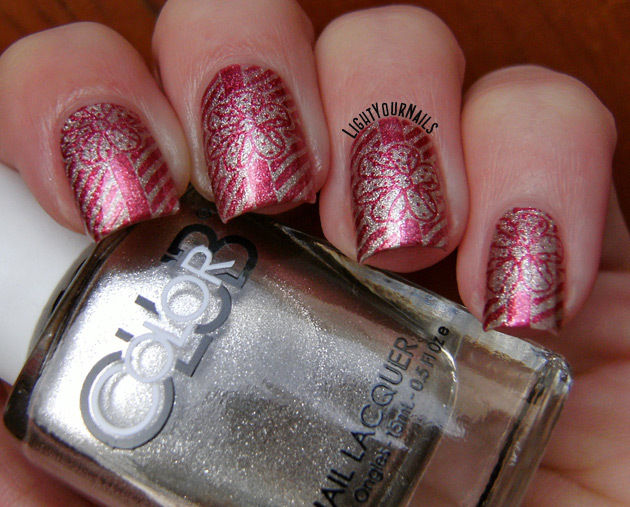 Beautiful stamping, great work !!! I can't remember if I commented on this or not, but I absolutely love this! The colors are beautiful together! Cute! And that plate is so great. I love this stamp! I tried to do freehand wrapping and it didn't turn out so hot. These look just like wrapping paper! These are super pretty. I love the little cleverly placed bows and they do look like wrapping paper. Great job! Such a pretty stamping job! Yes they do look like you wrapped my nails in foil and stuck a bow on top of them! LOVE! So gorgeous! Love your stamping! These came out so perfect! I can see your coworkers getting excited over these. Simo questo stamping ti è venuto benissimo, brava! Bellissima manicure! Dopo averla vista anch'io mi sono unita al Challenge:) Grazie cara dell'ispirazione! Grazie mille! Sono contenta che ti sia unita anche tu, più si è, e più ci si diverte!